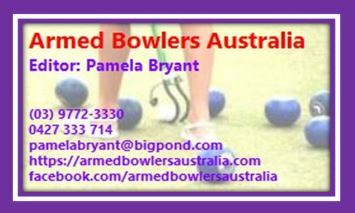 Bowlers Singles defeating Kevan Gaffney of the Latrobe Club 21/7 at Rosney Club. Peter was a member of the Tas. State Squad in Newcastle in 2018 where he skipped in the four’s and pairs, scoring a +1 against Vic (13/12)and a +2 against NSW (14/12) in the four’s as well as three draws in the pairs against SA(11/11) NSW (13/13)and WA (12/12). Below (courtesy of Bowls Tas) is a report on the Final of the State Armed Singles. Peter Thow Tas. Armed Sing. Champ.